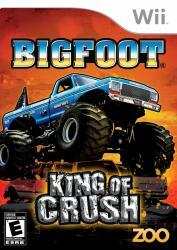 BIGFOOT King of Crush is a fast-paced Monster Truck game that rewards speed and destruction around every turn. Take your monster truck out of the stadiums and into the real world, crushing cars and smashing buildings in your bid to be the best Monster Truck driver there is. Smash through huge obstacles, slide around tight corners with four wheel steering and blast over the finish line. Massive destruction can reshape the course and define a new path for you to tear apart. Destructible objects spawn rubble to create a trail of destruction! Use the brute power and size of a Monster truck to reap destruction and observe true physics, simulations and smashes. Build up speed, engage the boost and hit those jumps hard and fast for some really big air! 12 Bigfoot trucks and 4 Torus Original trucks to choose from.